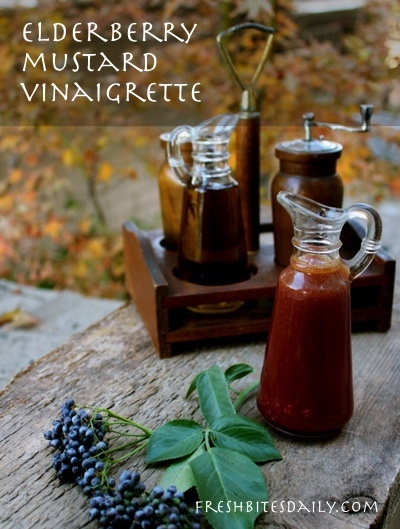 Elderberry vinegar is one that is simple to make and also makes a fantastic salad dressing. You can simply mix it with oil and perhaps add a bit of sweetener before tossing your salad or you can put together an actual recipe like the elderberry mustard salad dressing I offer you here. If you are starting this project without elderberry vinegar, that is your first step. Make an elderberry vinegar. I use fresh elderberries but dried berries work great too. With fresh berries I simply cover the berries with vinegar, about an inch above the berries. With a dried berry, I would add 2-3 inches of vinegar at the top (2 inches for a smaller jar, 3 inches for a larger jar) to allow some room for those berries when they rehydrate in your vinegar. Let it sit for two weeks or longer in a cool, dark place. Strain out the berries. Toss them. (Parts of what you’re tossing can actually make you sick so I wouldn’t add it to a smoothie or some such.) Keep your vinegar and go forth and eat salad! Combine in a jar 1/2 cup olive oil, 1/2 cup elderberry vinegar, 1/4 cup honey (or sugar), 2 teaspoons Dijon mustard, 1/4 teaspoon dried oregano, and 1/4 teaspoon ground black pepper. Taste for sweetness. Adjust to suit your needs.